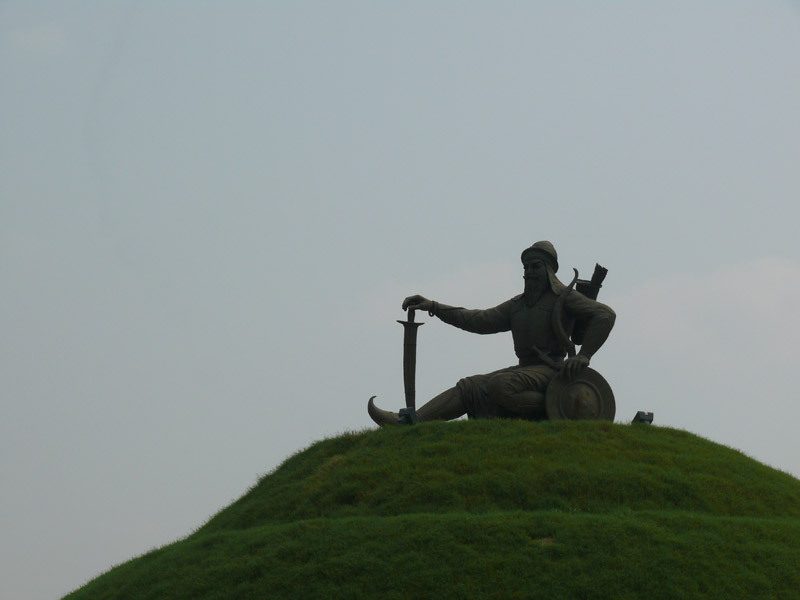 Baba Banda Singh Bahadur was born on 16 October 1670 at Rajouri in the Jammu region of Jammu and Kashmir. He was named Lachman Dev. Wrestling, horseback riding, and hunting were his major pastimes. As a young man, he once shot dead a doe and was shocked to watch the mother and her aborted fawn writhing in pain and dying. After this gloomy scene he had a change of heart. He left his home and became a disciple of a Bairagi Sadhu: Janaki Das, who gave him the name: Madho Das. In the company of the Sadhus, he travelled through Northern India and finally arrived at Nanded (in present-day Maharashtra), situated on the bank of the river Godavari. There he met Guru Gobind Singh who named him after meeting Guru Gobind Singh, who gave him the new name of Banda Singh Bahadu. He joined the struggle against the Mughal Empire in early 18th-century India He is best known for the capturing of the Mughal provincial capital, Sirhind, and is revered as a martyr of the Sikh army. His agrarian uprising against the Mughal administration in Punjab was a critical event that led to the development Dal Khalsa and the Sikh Misls by Nawab Kapur Singh which eventually led toRanjit Singh capturing Lahore in 1799 and establishing the Sikh Kingdom of the Punjab. After establishing his authority in Punjab, Banda Singh Bahadur abolished the zamindari system, and granted property rights to the tillers of the land.